If you need an attorney for an airbag injury claim or airbag accidental death case, let us help fight your rights throughout the United States. Our team of airbag lawyers can investigate your case and fight to get you the money and justice you deserve. Call us today to see if you are entitled to money from Takata or your car manufacturer for injuries or death cause by an airbag at 800-337-7755. Airbag lawyer Jason Turchin filed the first Federal airbag lawsuit in Miami against Takata Corp, TK Holdings, and Honda on behalf of a Miami Gardens driver who was injured when a piece of metal shot through her airbag and hit her in the forehead. The firm represents many other airbag injury victims. Honda Civic driver rear-ends another vehicle and the airbag explodes. A piece of metal shoots through the airbag and hits the driver in the forehead, causing injuries. The driver of the Honda Civic may have an airbag injury claim against Honda Motor Company and also Takata, the company who manufactured the airbag. A driver of a Dodge Charger automobile is struck by another car and injured when the airbag goes off and shoots a piece of metal coil through the airbag and into the drivers leg. This driver may have an airbag injury case against the owner and driver of the car that hit him and caused the accident, as well as against Chrysler and Takata for manufacturing a defective airbag. 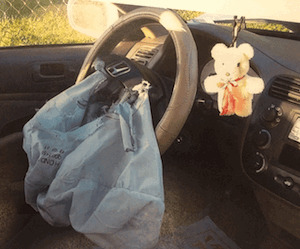 A driver of a 2001 Honda Civic who is injured after a car accident when the passenger airbag explodes and shoots through the occupant area of her car and lands in the backseat may have an injury claim against Honda and Takata if she was injured by the airbag. For example, if the airbag pieces were on fire or shot out of the airbag while they flew through the air she could have been injured or even killed. Takata Company was founded in the 1930s. According to its website, Takata began supplying airbags in the 1980s. In 1991, Takata established Automotive Systems Laboratory, Inc. as a research and development center in Michigan. Their mission is "your safety". It has been reported that Takata investigated defective airbags as early as 2003. These airbags may rupture and could cause metal pieces to strike drivers or passengers. Make sure the officer documents any malfunction of the airbag in the police report. If you go to the hospital, also make sure to report any injuries that you have because of the airbag. If you are able, have someone document any of the injuries that you have as result of the airbag. Have them take photographs of several different angles of your injuries and of any visible pieces of metal or parts of the airbag that were in contact with your body. Go back to the vehicle when you get a chance, or have someone else do it if you're not able to, and get photographs of the entire vehicle and of many different angles of the airbag in both the passenger and driver side. If there are pieces of metal or parts of the in a bag throughout the vehicle, take photographs of those as well. Get a copy of any police report that may be available. Get a copy of the traffic homicide report, if available. Get a copy of the EMS or fire rescue report. Get a copy of any hospital or medical records. If an autopsy was done, request a copy of the autopsy from the Medical Examiner's Office or whoever did the autopsy. Try to get access to the vehicle within which the person was killed. If you're able to access the vehicle, get photographs of the entire vehicle, the driver's airbag, the passenger side airbag and any other airbags in the vehicle. Look for signs of an airbag malfunction. This could include holes in the airbag, areas on the airbag which look like they have burn marks, and pieces of metal inside the vehicle that should not be there, like shrapnel or pieces of metal caps from the airbag inflator. If you receive any medical bills for the decedent, do not pay them without speaking with a probate attorney familiar with wrongful death claims. Contact an airbag wrongful death attorney at our office. What types of injuries could an airbag cause if it explodes? Eye injuries - When an airbag explodes, like a Takata airbag, pieces of metal from the airbag inflator or airbag inflator housing can rupture and cause pieces of metal or parts from within the inflator to explode and shoot these objects through the actual cloth of the airbag and into the driver and passenger area. These objects can fly into the eye or eye area of a driver or passenger. This can cause severe eye injuries including blindness, lacerations, bruising, or can shoot through the eye into the brain and potentially kill the driver or passenger. Lacerations - When metal fragments or pieces of the airbag housing rupture or explode and pieces of metal fly through the air bag itself into the driver or passenger area, they can cut the skin of the victim causing lacerations. These lacerations may require stitches, or staples and can leave permanent scars on the victim's body. They can also cut important arteries or veins, leading to the accidental death of the victim. Burns - When an airbag explodes, a chemical reaction is often created which may cause hot air or burning hot pieces of metal to fly through the air bag and injure or kill the passenger or driver. These burns can range from superficial redness to serious burns requiring skin grafting, wound care, debridement, and may leave permanent scars. Death - Accidental death caused by an airbag may occur if the airbag malfunction or is defective. A death caused by an airbag can result from several different types of airbag explosions or malfunctions. For example, an airbag explosion with too great of force can snap the neck of the driver or passenger leading to death. Pieces of metal shooting through an airbag can strike the driver and passenger in an artery or vein leading to significant blood loss and ultimately death. Pieces of metal or shrapnel from an airbag can also shoot through the body into organs, bone, and even through the skin into the brain or heart. Broken Bones - When pieces of metal from the airbag inflator housing shoots our at a high speed or velocity after an airbag deployment, or if the airbag deploys with too much force, a passenger or driver can break their bones. Broken bones are often referred to as fractures. There are several different types of fractures which can occur when the airbag explodes, including comminuted, hairline, or other fractures. If you were injured by an airbag, call airbag attorney Jason Turchin to see if you are entitled to money for your pain and suffering or other damages. Call today for a free consultation at 800-337-7755, or submit your airbag claim online today.